How about a luscious homemade smoothie to start the new year? If eating healthier is part of your New Year’s Resolution we’ve got the perfect blender for you. Whether you want to blend, chop, mince, puree, or mix something, you’ll need the best blender you can find and that is where Blendtec comes in. Blendtec has now introduced the ultimate in kitchen appliances and accessories to help you with all your blending needs, so grab those ingredients and get to preparing. What great blends will you create using the Classic 575 Blender with FourSide Jar? This blender has got you covered for any cooking job. No need to worry about grinding up, chopping, or dicing those harder ingredients like nuts, ice, or coffee thanks to the 3.0 peak HP motor for a stronger and more powerful blending experience. The vented jar lid lets steam out and also features a pour hole so you can keep adding more delicious ingredients as the blending commences. With preprogrammed cycles and five 50-second speed settings, you can’t go wrong with this blender. Meet your new favorite companion in the kitchen. The Designer 725 Blender with Wild Side Jar is Blendtec’s answer to all your blending needs. You’ll enjoy more than just the foods you create with this blender thanks to its sleek look and high-quality design. It comes with six preprogrammed cycles for smoothies, salsa, ice cream, whole juice, hot soup, and clean, plus a 3.8 peak horsepower motor and an illuminated touch interface and display for better visibility and overall convenience. Just when you thought your blending couldn’t get any easier, Blendtec created the Twister Jar. Compatible with all Blendtec consumer blenders, you can take those thicker recipes of yours and blend them to perfection now with this state of the art lid that was designed to get all those ingredients off the sides of the jar while the blender is in use so you never miss a single blend. The Blendtec Twister Jar also comes with a spatula to really scrape the jar clean of those last remaining bits of deliciousness. For those solo smoothie drinkers the Blendtec Mini Wildside Jar is the perfect kitchen helper. Pop this jar onto any of Blendtec’s line of consumer blenders and experience the powerful mixing capabilities so you can enjoy that single serving, just for you, of your favorite blended drink or food. There is nothing like waking up in the morning and settling down in your favorite chair with a hot cup of coffee. How about curling up on a cold, winter’s evening with a nice mug filled with warm tea, hot cocoa, or soup? There is something comforting about having that one mug that you always turn to when you are in need of a warm beverage. These four modern mugs will be perfect additions to your home and bring you so many more mornings of coffee and evenings of hot chocolate. 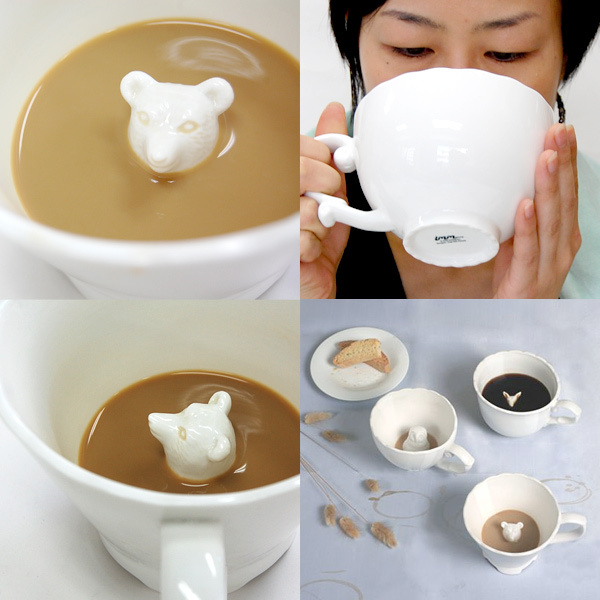 Enjoy the tastes of your warm beverage served in the adorable Hidden Animal Tea Cups. A cute little critter sits idly at the bottom of this mug, waiting patiently for you to finish those last sips of whatever delicious drink you chose to have. This delicate-looking tea cup is made from durable porcelain and is microwave and dishwasher safe, and comes in the choice of a bear, fox, or owl. Bring art to your coffee or tea drinking now with the ceramic History of Art Mug. Art enthusiasts will especially enjoy this creative cup that features smiley faces as interpreted by all their favorite artists from Da Vinci to Monet and Picasso to Warhol. For the solo tea drinkers out there who just want one cup, the Uni Brew-in-Mug is the unique accessory they’ll need. This innovative tea cup comes with a steel tea infuser that fits right inside the mug, so all you’ll have to do is add in the loose tea, pour in the water and enjoy a nice warm cup. You can use it at home or on-the-go thanks to its food safe lid that’ll keep it from spilling. Sometimes you just need that one simple cup or mug that will provide you with endless hours of coffee drinking. The Pantone Cup Classic is exactly as its name promises, a classic way to enjoy your coffee in a sleek, stylish, and high quality drinking mug. Choose from the four exciting colors and get that pot of coffee brewing. Are you throwing a posh party? How about a sophisticated soiree? Maybe you are planning a fashionable festivity. Whatever the occasion may be, if you are going to serve drinks, you will need some way to not only cool them but keep them cold throughout the evening. Modern and high-end is what you can expect with these four prime choices to chill all your bottles at that next great gathering. If you are looking for a trendy way to cool down those bottles for your exciting evening, then you’ll love the Stainless Steel Wine Chiller. See what happens when luxury meets functionality with this bottle cooler that will keep your pre-chilled bottles cold for up to three hours so you can continue enjoying that nice cool bottle of wine for longer. With gel freezer packs instead of ice, you won’t have any mess to worry about at that dinner table. Perhaps your party starts indoors and then proceeds to the outdoor patio for some music and fine dining in the moonlight. The Ice-Less Lounge Bottle Cooler is functional for both indoor and outdoor use with its handles that make it simple to carry. You’ll never need ice again thanks to the four removable cooling packs. With its stainless steel design and fine matte finish, you’ll get a stylish cooler fit for any party. Bring some marvelous cooling to the dinner table with the VinOice Wine Chiller. Simply freeze the chilling rod for 30 minutes and then inserting it directly into the wine bottle so the cooling can immediately begin. When you are ready to drink, there is a rubber wine pour spout at the top so you can just as easily serve the wine as it was to chill it. Who wants to have a party or dinner where you have to worry about the ice melting everywhere and leaving a trail of water all over the place? The Easy Double Walled Bottle Cooler will eliminate the need for ice because of its durable, stainless steel, double-walled design that keeps bottles at the optimal beverage temperature for hours. Your drinks will stay cool as you continue being the best host or hostess that evening.